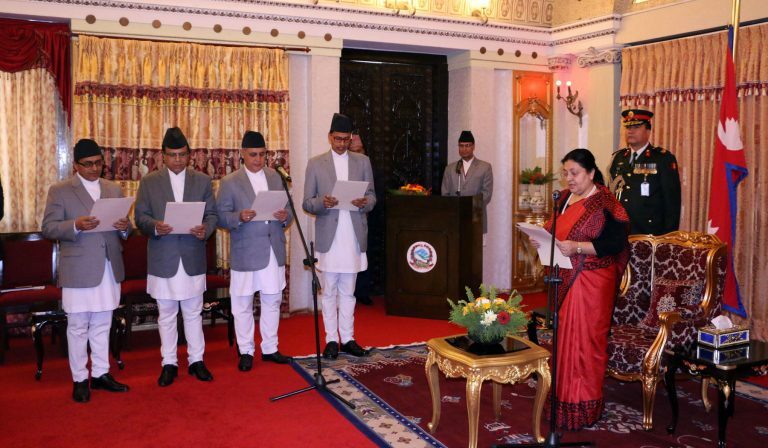 Nepal foreign Affairs (KATHMANDU, 18 February 2019) – President Bidya Devi Bhandari administered the oath of office and secrecy to the newly appointed Ambassadors of Nepal to various countries. At a special function held at Sheetal Niwas today, Nepali Ambassador to United Arab Emirates Krishna Prasad Dhakal, Nepali Ambassador to Malaysia Udaya Raj Pandey, Nepali Ambassador to Kuwait Durga Prasad Bhandari and Nepali Ambassador to France Dipak Adhikari took oath of office. Also present on the occasion were Foreign Minister Pradeep Kumar Gyawali and high-ranking government officials.